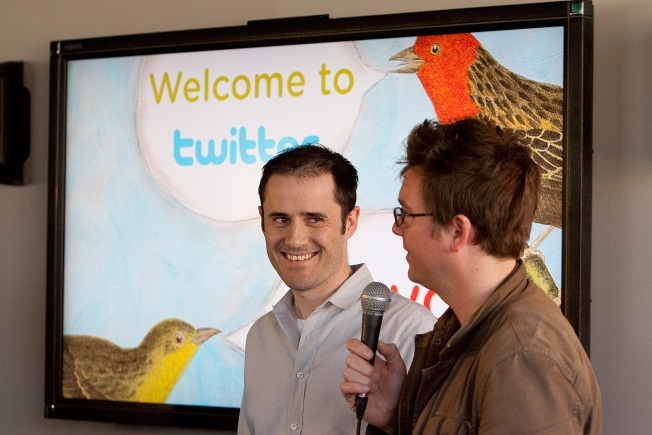 Twitter co-founder and CEO Evan Williams (L) and co-founder Biz Stone attend a meeting with San Francisco Mayor Gavin Newsom at Twitter headquarters March 10, 2009 in San Francisco, California. Twitter, the new social networking service that allows users to send out and also read text message updates from others, is fast becoming very popular all over the world. In the fast-paced, ever-evolving world of the social media web, it's often hard just to figure out how to use some of the more popular sites that let you share your favorite articles and videos. The basic idea with many of these sites is that community members vote up their favorite content. The shared content that becomes most popular or viral appears on the front page of the site in question. Reddit and Digg, both headquartered in San Francisco, are among the most popular. They, along with Stumbleupon, reach hundreds of thousands of people a day. Some of the other better known social media sites include AOL-owned Propeller and Yahoo-owned Buzz. They are smaller in popularity but are much appreciated because moderators sometimes take the most popular shared content and put it to the front page of AOL or Yahoo. That brings incredibly massive exposure and traffic to whichever site is given the honor. One of the other upcoming social media sites is Tip'd.com, which concentrates on business news. The site started small but has doubled in traffic in recent months, partly due to increasing demand for business news amid economic troubles throughout the world. The staff at the site has unveiled a gaggle of new features that they hope launches Tip'd into the same sphere as the more well-known social media giants. One of the new features is called the "social ticker." It doesn't just give a stock update, but more importantly, shows the latest blog posts and tweets from around the world mentioning the company. The integration of Twitter into the picture here is the first time a social media site has taken Twitter's public feed and mashed it up with blogs to present information about stocks. Could this be the way that stock traders and financial buffs of the future find out about companies? Not only that -- but will live Twitter information such as this give so much insight into the "hive mind" of the human race that it will fundamentally change the way people interact with their portfolios? Think of it. You are unsure whether or not you want to sell a stock. You check your iPhone and look at the "social ticker" on Tip'd. What if you run across a boatload of info about lawsuits that may be filed against the company? Maybe your gut tells you to sell. This has happened throughout the history of the stock market but never with the dizzying speed that Twitter enables. Maybe in the past you might never have learned about the pending lawsuits until it was too late. This real-time worldwide information could signal change throughout the financial markets. Right now the social ticker is limited to stocks on the NYSE and NASDAQ. By the way, the site isn't just unveiling the social ticker, but video integration, a tool to invite your friends, an application for Facebook and features designed to give props to the most popular "power users" on the site. Among the most interesting new features that celebrate the power user is a Top 100 page, which shows the people who have sent the most stories to the front page of the site.